At St. Cecilia’s Infant and Nursery School we both recognise and value the importance and significance of the role that parents and/or carers play in their child’s education. We will endeavour to support your efforts at home and increase the opportunities that school can provide for you to engage fully in your children’s education. On a regular basis we will signpost course/learning programmes that will take place locally (please check bulletin board/newsletters/flyers) which you may wish to access. On occasion workshops will be held at school and we will promote these and encourage you to attend. The school prospectus contains information regarding the school uniform, times etc. Please visit the page to view a copy. If you live in Liverpool and receive any of the following you can claim free school meals for your school-aged child. Child Tax Credit (provided you’re not also entitled to Working Tax Credit and have an annual gross income of no more than £16,190). If you think you may be eligible to claim please click here (link opens in new window) to apply. PASCINS are a great support to our school. They raise funds through fairs, and Christmas activities, as well as creating memorable experiences for the children in our school. Santa’s grotto is truly magical! Please come and find out how you can help PASCINS to help the children in our school. Click on the link below to find out more information. PASCINS is the Parent’s Association for St Cecilia’s Catholic Infant & Nursery School. As parents of children in our school, your views are important to us. We would love to get your feedback on how well we are doing. On the Ofsted Parent View page, there is a short questionnaire with just 12 questions. Please follow this link (opens in new window) to register your views. Please see the link below for up to date information on the latest publication by the DfE regarding tackling child abuse. We believe that parents/carers also play a crucial role in ensuring that their children understand the need to use the internet/mobile devices in an appropriate way and aim to work with parents / carers to do so. 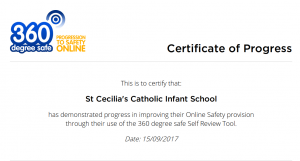 We are committed to E-Safety and are working towards the 360 Degree E-Safety Mark. If parents / carers have any questions or concerns regarding , please do not hesitate to contact school. The following video has been produced by CEOP (Child Exploitation and Online Protection). Vodafone publishes a magazine, with How To Guides and articles linked to technology and E-Safety. The magazine (and information) is available online – and you don’t need to be a Vodafone customer to access it! Watch the following video to see how to make searching safer for the whole family. 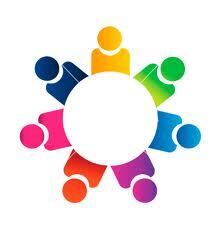 View more useful links on our Links page. Below are copies of our Acceptable Use Agreements. These will be issued to parents / carers at the beginning of the academic year. We ask that you talk about the content with your child (children) and that they are signed and returned to school.